While there are 200 species of army ant living across Central America, South America and Africa, they share common adaptations -- ones that make them lethal and efficient hunters. Army ants are so named because they travel in enormous groups and attack their prey ferociously. These ants are highly efficient predators, even when confronting animals much larger than themselves. Though army ants aren't large predators, they're powerful ones, and in large part because of their capacity for teamwork. They live in a group called a colony, which consists of anywhere between 100 thousand and two million others. These creatures work, live and hunt together, marching in columns that can extend to more than 650 feet long. In a colony like this, it doesn't matter that an army ant by himself is no longer than half an inch -- he has more than enough backup to maintain his reputation as a force to be reckoned with (See References 1, 2, 3). Because army ants live in such large numbers, they are adapted for nomadic living. Instead of living in one overstuffed nest, they travel throughout the habitat, swarming on whatever prey they come across, such as roaches, crickets, scorpions, tarantulas, snakes and birds. When they need to temporarily settle down, they form short-term nests in hollow logs and trees, where they hook their bodies together to form a living shield around the queen and her eggs. 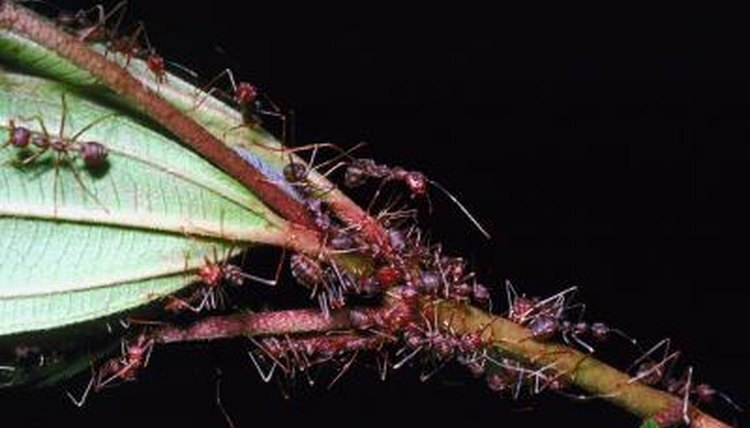 To function in such large groups, army ants must communicate effectively with each other. This is made possibly by chemical pheromones, which they release into the air or smear on parts of the habitat for navigation purposes. Pheromones are coded with messaging that the group understands -- it may, for example, signal that there is trouble or prey ahead. Army ants can also communicate distress or a need for aid with their pheromones, or that they recognize other members of the colony. Army ants are well-equipped for killing prey -- this, along with the large numbers in which they swarm, accounts for their ability to devour creatures much larger than themselves. They have distinctly large mandibles and stingers, which they use to overwhelm their prey when they swarm. As they subdue their prey with stings and bites, they either eat it on-site or rip it to shreds with their mandibles, then carry the pieces back to the temporary nest to share with the group. Huffington Post: When Army Ants Attack, Nothing Can Stand In the Way of "Nature's Mongol Hordes"